FANTASIC NEW PRODUCT! A MUST HAVE FOR ALL CAR OWNERS, VANS, CARAVANS AND MOTORHOMES ALSO WORKS IN HOUSES AND FLATS!! AS SEEN ON TV! NO BATTERY REQUIRED ESSENTIAL IF YOU ARE LEAVING ANY PET OR PERSON IN YOUR CAR (BUT PLEASE DONT FORGET ABOUT THEM!) 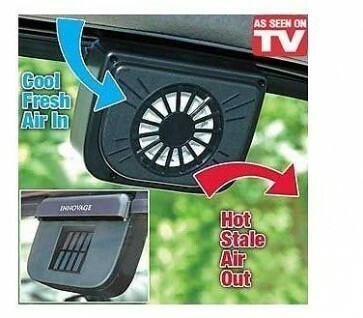 FRESH AIR IS DRAWN IN AND HOT STALE AIR VENTS OUT REMOVES ODOURS AND SMELLS FROM THE CAR OR FLAT/HOUSE WINDOW! NOTE THAT IF YOUR WINDOWS ARE HEAVILY TINTED THE SOLAR PANEL MAY NOT WORK VERY WELL FITS ALL CAR, VAN, MOTOR VAN AND CARAVAN WINDOWS!! GET YOURS NOW! BUY TWO OR MORE AND SAVE ON THE POSTAGE!! UK SELLER - PROMPT QUICK DESPATCH!